Roaming the Countryside: Sterling Mei: (34) "Fully Ours - Again!" 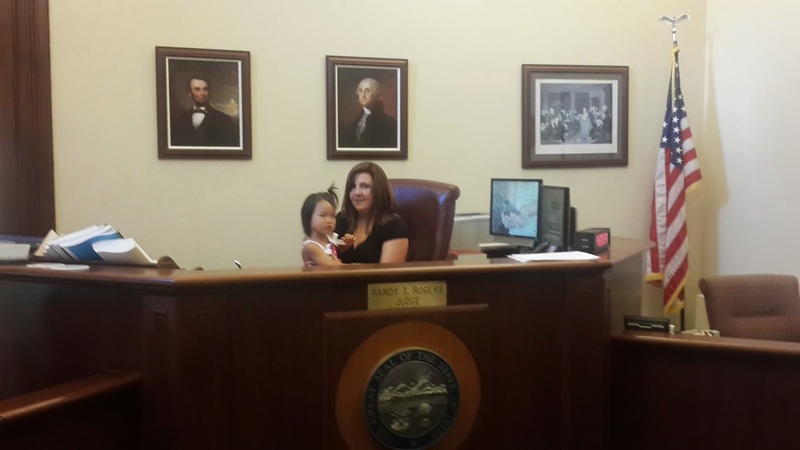 Shortly after 9:00 this morning, we found ourselves in a familiar courtroom. Ten years ago we were here to re-adopt Aleksandra. Nineteen years ago Kellie and I were here to obtain our marriage license. 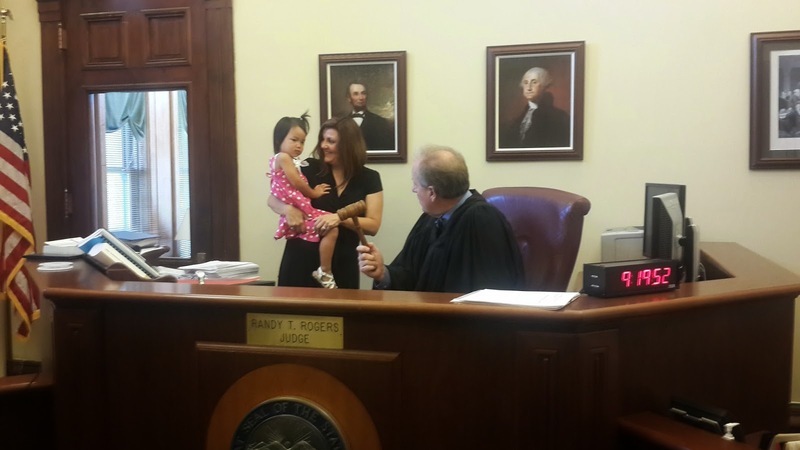 A re-adoption is done in the case of international adoption for the purpose of gaining a birth certificate "that is easier to read" according to Judge Rogers. While it grants no additional legal standing to Sterling, it will make life easier for her (and us) since now a U.S. document can be presented rather than a beautiful Mandarin Chinese portfolio. There we no attorneys present today, and I had on my new suit... so I opted to sit in the attorney's study under the rotunda. 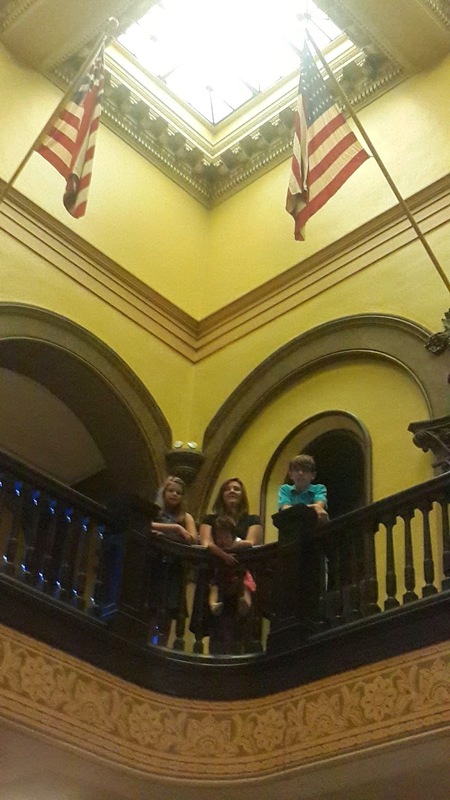 The family climbed the staircase to the top floor of the historic courthouse. The light shined down bright from the sun, covering our U.S. Flag in beauty. We took the moment to reflect on foundational belief. Sacrifice. Honor. Duty. We are thankful. We are indebted. We are patriots. 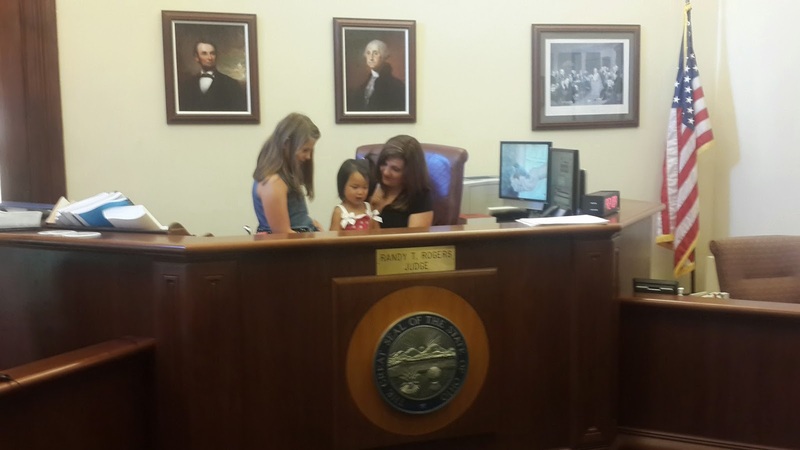 Our name was called out...our family filed into the chambers, and we stood for the entrance of the judge. Kellie and I raised our right hands and swore to tell the truth, the whole truth, and nothing but the truth. My hand was raised to the judge and my soul was turned to my God. The oath was a prayer. I believe it to be binding. Judge Rogers asked, "who will be first?" After a brief pause and an exchanged glance I found my voice and heard it echo in the chamber, "that will be me your honor." For the next ten minutes, I spoke about my faith. I talked about my God. I shared our story. Every word from my mouth was this walking, talking testimony of our love of God. It was the same for Kellie. Question after question came from the bench. Why are you adopting? Why China? Why would you adopt from multiple countries? How did you become involved in Guatemala? What prompted you to move to Guatemala? Suddenly we relaxed as we simply told the story of God adopting us and loving us like a father. We shared how the love of God is what give us life and that we have a deep desire, a need really... to simply give it back. 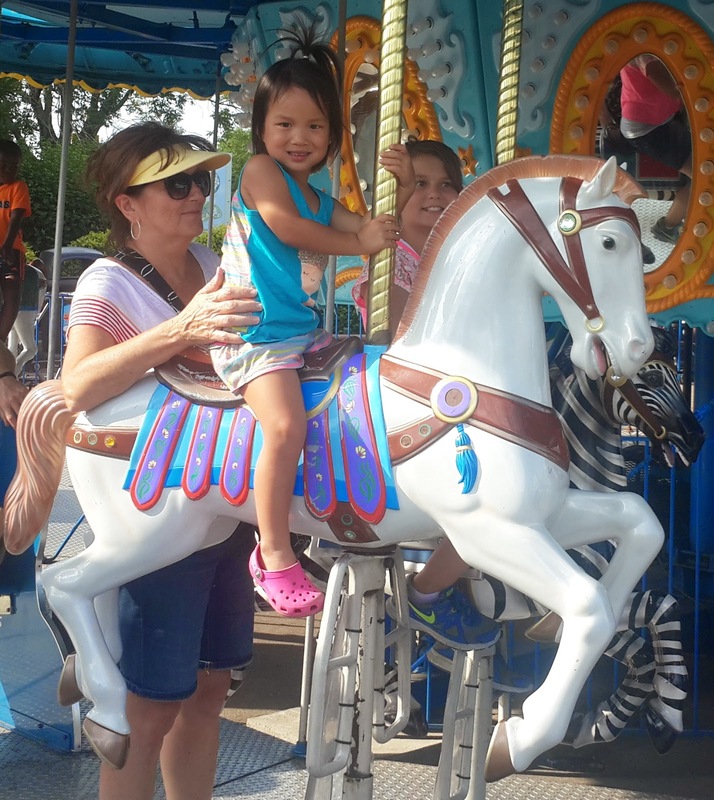 Our children represent our relationship with God. The formal hearing somehow blended into shared stories of faith that flowed from both sides of the bench. The judge leaned back so he could see through the corridors and we heard him whisper... "this is what it's all about. I have a little Russian girl and a Chinese girl in my chambers and they're beautiful." 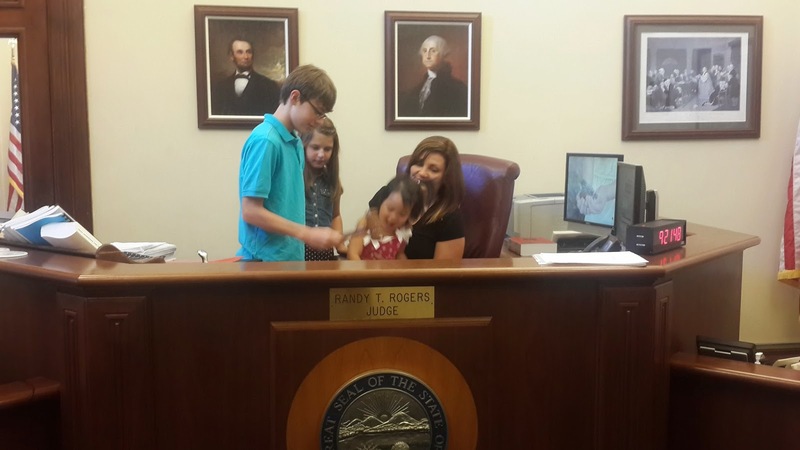 Judge Rogers then banters back and forth with our three kids, finally saying, "ok, here's the all-important question. Caleb & Aleksandra, do you want to keep her?" Kellie and I held our breath.. and both kids laughed and said, "yes!" Judge Rogers replied, "then there is one final thing to do to make it official. He asked Sterling to approach the bench, explaining, "I have 3 gavels. A wee little baby gavel, a mid-size mommy gavel, and a great big daddy gavel. Sterling, your job is to bang the gavel." Now, the judge is a very big man and Sterling is a very small little girl. As Abraham Lincoln, George Washington, and Mommy smiled on, Sterling sized up the Judge. And the judge failed the test. Sterling was simply not going to cooperate. 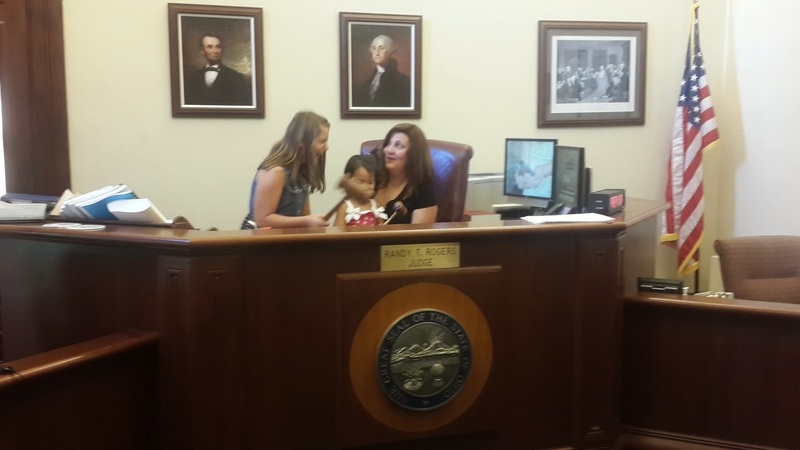 The wise judge gracefully stepped away, offering Kellie and Sterling to sit in the seat of Justice. I winked at the judge and whispered, "oh, I'm in trouble now." Without missing a beat he said, "yes you are." Sterling still was reluctant to touch even the wee little gavel. Undeterred, the Judge turns to Aleksandra proclaiming, you don't remember it, but you've banged my gavel before. Young lady, come show your sister how it's done. And so the party at the bench grows as Aleksandra takes Sterling's hand. Together our daughters, a little Russian girl that was taken to the steps of a hospital and abandoned, and a little Chinese girl who was born pre-mature and left in a city park... they lifted the wee little gavel, and they brought it down with a slam onto the wooden base! The proceeding was official. In the words of my wife, "Sterling is ours - again!" The cheering in the room seemed to ignite a fire in Sterling that suddenly burned away all apprehension. As Aleksandra reached for the mommy-sized gavel, Sterling begins slamming down the wee little baby-sized gavel! This is life abundant! George Washington and Abraham Lincoln calmly look on as chaos ensues! 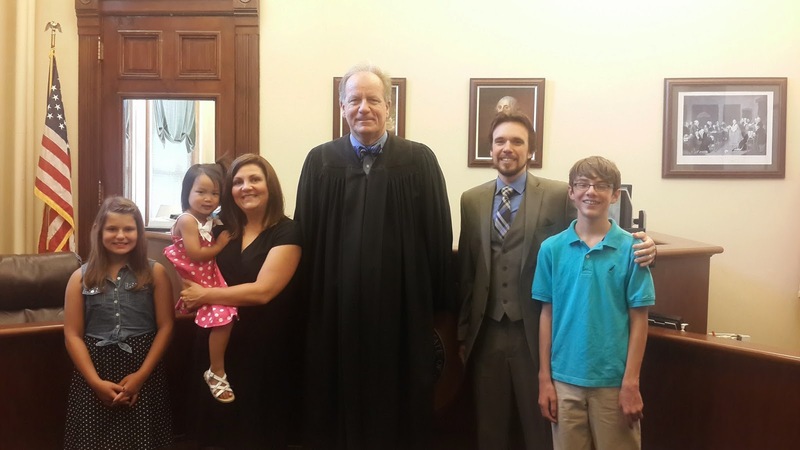 The Honorable Judge Randy T. Rogers observes from the side with a smile that beams from ear to ear! Laughter is echoing throughout the chamber and spills abundant into the corridors. People are looking in the doorways! 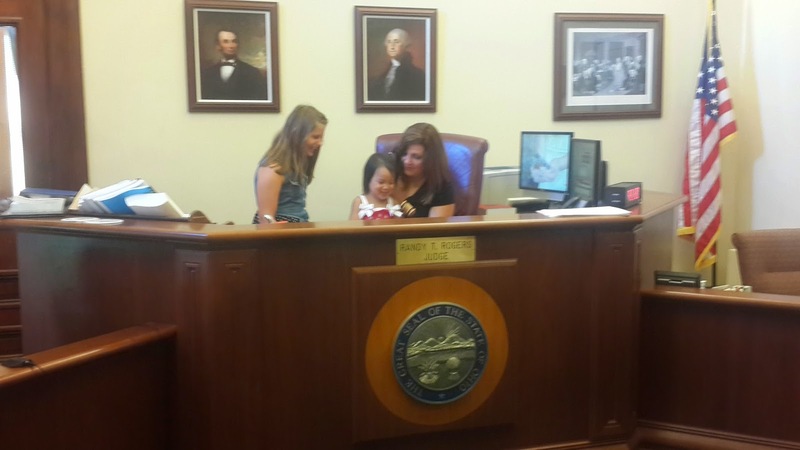 Sterling looks to Aleksandra and exclaims, "you've got the Mommy-sized gavel!" His honor realizes that no-one has the daddy-sized gavel and he orders Caleb to step forward and execute the court order of adoption for his sister using the giant gavel. The sound of the impact was shocking. Caleb had indeed signified the close of the case with a resounding strike. This little trip home has been a series of God-moments. Times where He just seems to show up big. Like... having our total process time from document file to final hearing be 7 days... and He showed up again today. We had court costs and processing fees due today. Without preamble or explanation, the judge waived all fees. We walked out of the hearing without dropping a cent. I was ready to run for the door, but my wife turned to the clerk and said, "what do we owe?" To which the clerk replied, "you owe nothing, the case is closed." This is the work of my God. You owe nothing. The case is closed. This is salvation. This is what I am shown by God over and over and over. The account is closed. The judge has paid my debt. And so, for the first time (again) we introduce you to Sterling Mei Shepherd, our daughter. She's our 3rd child. 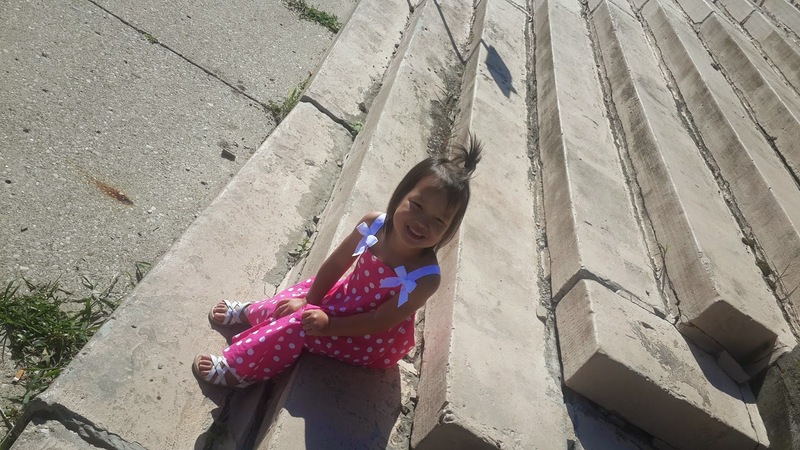 We adopted her in her origin of Guangzhou,China and now we have re-adopted her in the city of our origin, Hamilton, Ohio. It's all really a big fuss about nothing. She's been ours since we first began this process, 5 years and 3 months before she was born. Today was a day to celebrate! I mean, what girl doesn't want a fairy-tale ending on a white horse? Welcome home Sterling... wherever we may roam!